SCI uses vocab resources for various things. The only one you can edit is the one that contains the words the SCI parser understands. The words are listed in the view, along with their Group (not significant for editing) and Class (the type of word is it). Synonyms are grouped together on one line. To add a word to the game's vocabulary, click the New word button, or right click in the view and choose New word . Type in your new word and hit enter. Click on the word and press DELETE. 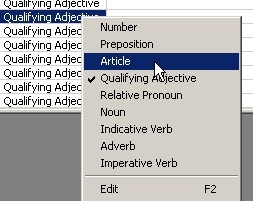 There are two ways to find a word in the vocabulary editor. You can use the Find button, or simply just type the letters of the word into the view. It will automatically scroll into view and be selected. Find the word you want to edit, and right-click Rename, or press F2. To add a word as a synonym of another word, just add it to the end of the first word, separated by a space or a '|' character. The class of a word (e.g. verb, noun, etc...) affects how the parser will interpret it. Consult the SCI tutorials to learn more. Right-click on the word and check or uncheck one of the nine classes. Mulitple classes can be applied to a word.